A conference, convention, gathering of grand wizards. Just some of the things I’ve heard a convergence mistakenly called over the years. If you’ve never been to one then you’re missing out – but missing out on what!? What is a convergence? I’ve been working at the Permaculture Association for almost 5 years now. This September’s national convergence near Oxford will be the sixth convergence I’ve been to. I have fond memories of each one and plenty of things I look back on, glad to have participated. What’s it like as someone who only knows a little about permaculture? I found permaculture through community gardening. My understanding was enhanced by a friend’s bursting bookshelf – how to make a forest garden, permaculture a beginners guide, the earth care manual and others. Plus, many YouTube videos – Sepp Holzer’s farm tour and A Farm for the Future made a particular impression. Other than my friend Viv though, I hadn’t met anyone else who knew what permaculture was, let alone people actually using it in their garden in this country, or making a living using permaculture! Fast forward a year and I was working at the Permaculture Association, packing my bags to go to Gilwell Park, in Chingford, Essex for the 2014 convergence. I’m an Essex boy, so it didn’t feel too foreign, but I did wonder what I was getting myself in for. 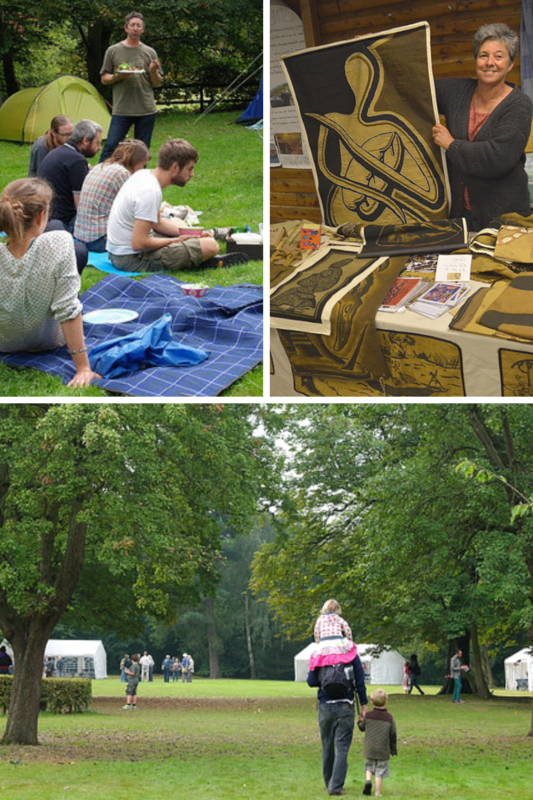 When I arrived at Gilwell Park there were marquees, wristbands, a camping area, handmade signage, and a marketplace. It felt a bit like a festival. The printed programmes spelt out all kinds of topics to be covered, from a demonstration network strategy session to learning about broadforks, pressing apples, and a Ceildh [kay-lee]. Eclectic and diverse! With everybody on site, greeting each other, laughing and admiring the majestic oak trees, it felt very friendly. Not everybody knew each other but some people had met before. Not everyone was an expert and there were plenty others who also hadn’t been to a convergence, I wasn’t alone! Arriving from across the country, walking from the train station or in an electric car to be plugged in, however they arrived they were certainly pleased to be there. Still, what happens there? Here are the three key elements that stand out for me. Those things you’ve seen mentioned in a chapter of a book, or watched a short YouTube video of from an enthusiastic American but wondered if they actually work and how you could do it. There’s often workshops on some of those things at convergences: making biochar, rocket stoves, propagating perennial plants, etc. The programme is different every time and is almost entirely reliant on the participation of those attending. If you’re attneding, you’re invited to offer a workshop in advance. Last year in Manchester I was brave enough to offer an hour session on food preservation techniques, including samples of elderberry tincture and apple and fennel leather. The programme is also responsive to the current needs of the network. 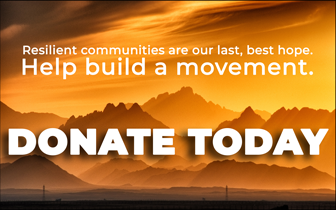 That may be planning how the Permaculture Association can support a particular group (Educators, for example), or how we as permaculture designers and activists can work in our communities to effectively offer solutions. For example, permaculture projects are welcoming refugees, they’re offering youth activities, providing food to the hungry. You will likely hear more about current projects from presenters at this year’s convergence. The learning goes beyond the workshops too. Of course, it’s the edges that are ripe with rich conversation. I’ve learnt a lot at after-dinner conversations. I often think if we all just gathered together and talked for a weekend then it’d be a valuable experience in itself. Discovering the unique wonder of a permaculture convergence for the first time leaves a lasting impression. See the string of comments on this post in the Permaculture UK Official Facebook group. Each and every person has something valuable to share, and everybody mucks in to make the event run smoothly. No matter how much you know about permaculture, you’ll be welcome. There is almost always some kind of marketplace, where participants flaunt their creative wares, sell their homegrown perennial plants, and sign copies of their new book. Ahh, and some wonderous people also remember to bring along cake or a traybake for the cafe to sell. There will always be a stall somewhere with a book, magazine, and seed swap, often anarchically organised, with a sign written on a piece of cardboard with a permanent marker. Another great thing about convergences is that there’s space (physical and figurative) for participants to meet their own needs. Whether that be setting up the seed swap or adding a new workshop to the timetable. I like the concept of chaorder to explain this, the middle ground between chaos and order. The convergence sets up a framework to bring order to the collection of people in attendance, whom fill the space with their ‘chaos’. It’s always uncertain who will be at the event and what they want. Also, most of the problems facing our world are so complex that one person or one group alone can’t possibly solve them. By coming together, with our shared ethics of earth care, people care, and fair shares, we can bring a bit more order to the chaos of our world. There’s an ongoing joke that you can tell who has been to a convergence before (or at least read the pre-arrival information emails) because they’ll have brought their own cutlery and crockery. It saves a lot of work in the kitchen, meaning the caterers can prepare food and not wash up hundreds of bowls. So, yes, bring your own bowl and cutlery, and take two minutes to wash them up yourself after meals. Bonus points if your bowl is hand carved! I love food and it’s the reason I got into gardening – to grow my own fresh, delicious food! Food festivals are one of my favourite kind of events – there’s always something delicious to try. 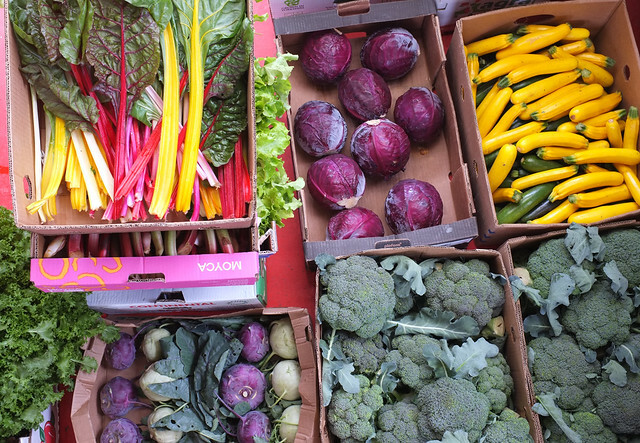 Food at its most basic is fuel for our bodies, but I think it can also fuel our activism. The offerings at a convergence are just what’s needed to keep you switced on for the full weekend of wandering, pondering and chatting, with an appetite to make your world a better place. The menu aims to be inclusive by being vegetarian and have a positive impact; the dedicated caterer sources fresh, seasonal, organic ingredients from workers coops and permaculture projects as much as possible. It is then lovingly prepared by the experienced kitchen team and I’m sure some kind of magic pixie is smuggled in to finish it off. It is so delicious! Then, often you learn something too. Whether it’s a new flavour combination or seeing just how effective a haybox is. I hope that’s given you a good idea about what to expect from a convergence. If you’ve any questions, please don’t hesitate to contact me – tweet @permaculture_uk or use our contact form. And you could browse through Permaculture Association Flickr photo albums. 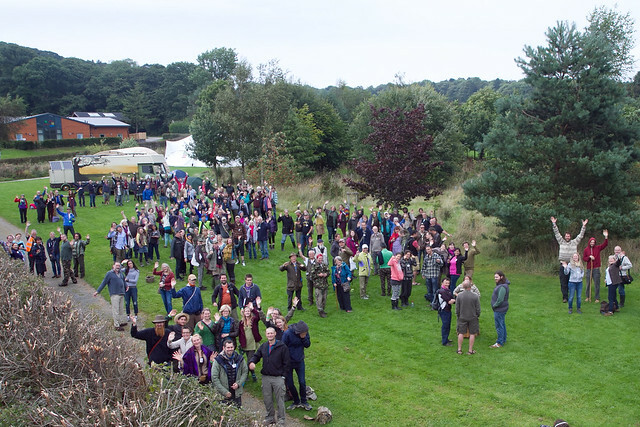 I hope to meet you at the national permaculture convergence in Oxford this 6-8 September. 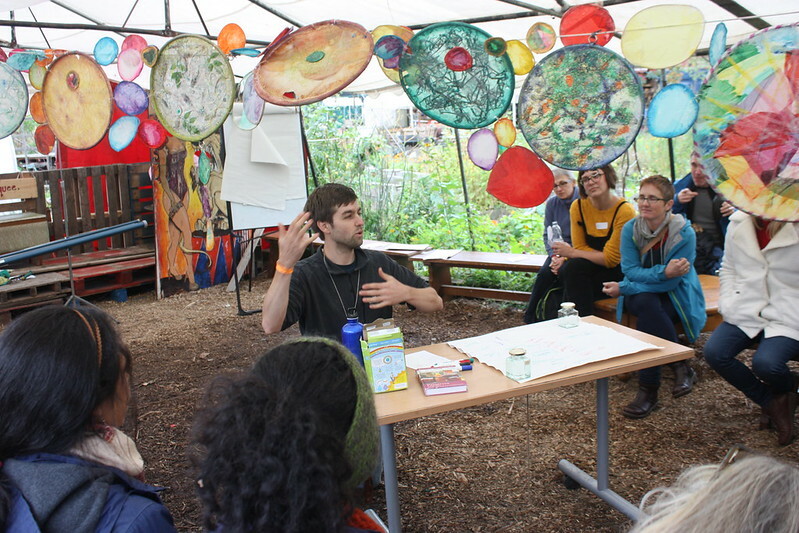 Ryan Sandford-Blackburn is Strategic Communications Coordinator at Permaculture Association, where he works to promote the great work of permaculture practitioners and activists in Britain and around the world.